Dozens of news accounts in 1893 discussed the hotly contested beer awards made at the World’s Columbian Exposition in Chicago. The awards committee for the brewing category was composed of five judges: Messrs. Lund (Canada/U.K. ), Lichtenfeldt (Germany), and Wahl, Weigel, and Rolf (all U.S.). A government agricultural official working in the executive awards committee’s office, named Browning, put together reports written by the judges for each brewer. He notified Anheuser-Busch in St. Louis in October that its beers gained the highest score. But the judges had not yet met to finalize and issue their findings. When they did, on November 15, the highest score was attributed to Milwaukee’s Pabst Brewing. This press account of December 26, 1893, published in Houston but originating in Chicago, as well as this Indianapolis news account, give considerable detail on what occurred. In a nutshell, it seems Pabst was docketed two points each on two beers for chemical purity by the government chemist, Dr. Harvey Wiley (a familiar name on these pages). When the judges restored those points, alleging clerical error in their deduction, it put Pabst ahead of Anheuser-Busch on the beer called Standard – I think this was Best Select, later called Blue Ribbon – which rose to 99 points. 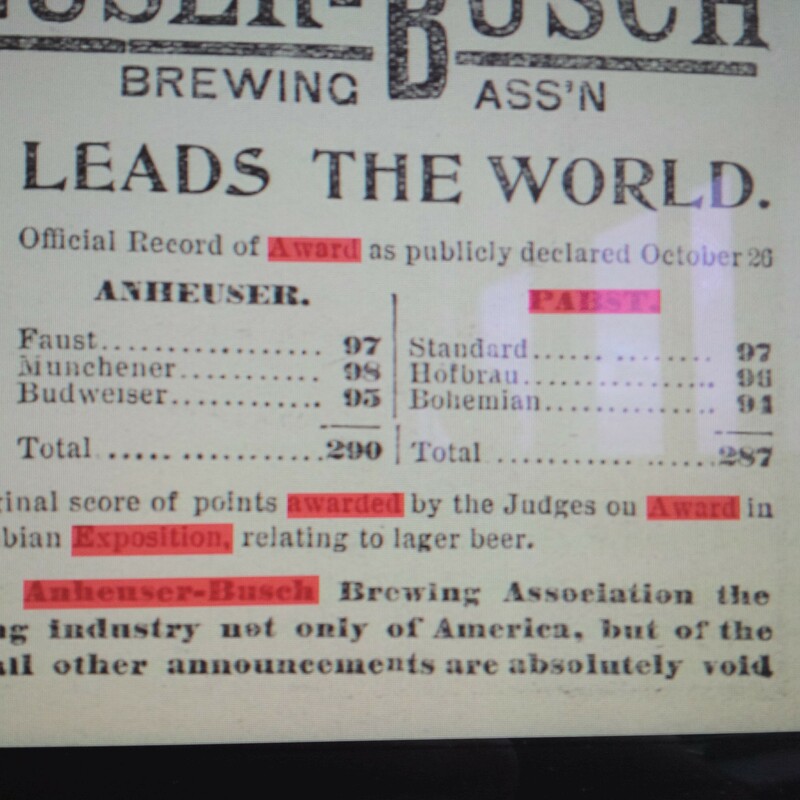 With Pabst’s Hofbrau also gaining two points, at 98 it gained equality with A-B’s Munchener. Overall for the six beers stated by A-B in its ad reproduced herein, Pabst stood first at 291 points. Thus, Pabst had the highest scoring individual beer, and lead by one point as to this group of six beers. More than six prizes between them for beer were won by both companies, but on any view of it, the judges’ decision in November gave the palm to Pabst. A-B challenged what it viewed understandably as a flip-flop, but an appeal under the Exposition’s rules didn’t alter the points revision as such. A-B also contested deduction of points from its own beers and litigation ensued into 1894 at least. Each brewer put out ads claiming to be the Exposition winner but despite A-B’s efforts Pabst generally was regarded as winner. In her Ambitious Brew: The Story Of American Beer (2006), Maureen Ogle gives a lively and informative account of the brouhaha, involving as it did outsize personalities and important commercial interests. Below, I’d like to focus on the beer rating system the judges used. The judges used a 100-point scale, divided into 15 for brilliancy, 20 for flavour, 20 for commercial importance, and 45 for chemical analysis (purity or absence of improper foreign matter). I find this system very interesting viewed from the perspective of a beer fan of 120 years later. Under the judges’ system, if a beer reached 80 points, it was entitled to an award. The numbers in the image above, from a typical ad published by A-B in the wake of the judging controversy, show the result from its viewpoint. Taking brilliancy first, until recent years it was regarded, as in 1893, as a sine qua non of quality. Yet, as with so many things in life, it is gone with the wind, not to be sure for the mass market, but for the craft and “progressive” side of the business. Cloudy beer is “in” and has been for some time, probably because it is regarded as more natural. It is partly too a result of the influence of cask beer, which in England historically was not meant to be cloudy but usually was in North America, and beer bottled with some residual yeast, or bottle-conditioned beer. But in 1893 a cloudy bottle would dock you points for your beer exhibit. Indeed as we have seen, contemporary science strived to justify use of corn and rice adjunct mainly because it would ensure a clear bottle of beer. Today, under the influence of the “drink local” ethic and (surely) better process controls, cloudy beer is not the non-starter it was in the 19th century. 20 points for flavour seems low to me, even for 1893. I’d have made it 40 points and removed “commercial importance”. This latter category caused controversy even before the judges sat down to drink any of the exhibited beers. As Maureen Ogle indicated, there is reason to suspect it was designed to favour the beers of the largest brewers, and there was no one larger then than Pabst and A-B in America. Assuming the formulation was meant in good faith, I think it could have meant, in effect, drinkability or general appeal. Lots of beers today would rate very high on a pure flavour scale, say Stone IPA or Pilsner Urquell, but few would argue they have wide appeal. Anyway at the very least this category was ambiguous and should have been combined with the flavour one. (Maybe “flavour and general appeal”?). Now why 45 points for chemical analysis, the category that caused so much trouble in the judging? Would we include anything today on this ground, require that is the beers to be tested for chemical purity? Not to my knowledge. It is assumed today that products on the market, including beer, comply with food and drug compositional laws. Indeed each country’s laws provide for various things that can appear in finished beer or not, additives if you will. But as discussed earlier here in various contexts, in the 1800s purity was a large concern in the nascent consumer economies. People were increasingly worried about what went into the daily bread, beer, and other comestibles needed for survival and health. Hence the large number of points attributed to this value then. Today, beer rating systems typically look at different values: adherence to style, for example. Not a concern in 1893 when beer styles were still emerging and not regarded with the sanctity of today. Other criteria today, partly related to style, include conformity to prescribed colour, bitterness, alcohol, and gravity targets or ranges. Of course, flavour remains as an important element. It is the most important, really. I think it was then too but in the context of Victorian America, an industry in full expansion, and the dynamics of a major commercial exposition, the rating system that resulted to a considerable degree reflected its times.